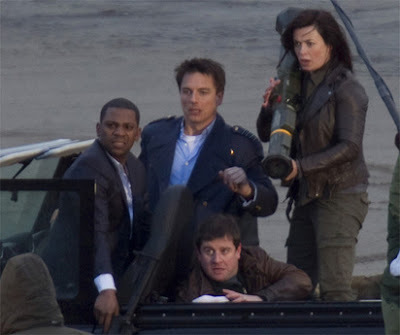 Pencils Down, Pass the Remote: Analyzing the first full trailer for "Torchwood: Miracle Day"
Analyzing the first full trailer for "Torchwood: Miracle Day"
Mekhi Phifer, John Barrowman, Kai Owen and Eve Myles in Torchwood: Miracle Day. Photo courtesy of scifipulse.net. The first full trailer for this summer's Torchwood: Miracle Day is out, and it is certainly promising. I already mentioned how excited I am about the first season of Torchwood to be set in America (although it does take place in Los Angeles), and the trailer has only increased my anticipation. One of the reasons I'm so excited about the new season of Torchwood is the format: ten episodes that function more as a miniseries than a series, heavily serialized and following a single story. This format made the third season, Torchwood: Children of Earth, far superior to the first two, much more episodic, seasons. The similar format of Miracle Day is encouraging. A major difference between this season and Children of Earth, however, is the prevalence of American accents in the trailer, which is certainly jarring in a series that spun off from the quintessential British series Doctor Who. Besides Alexa Havins, who plays Esther Drummond, an American who joins forces with John Barrowman's Captain Jack Harkness and Eve Myles' Gwen Cooper, the series features Mekhi Phifer, Bill Pullman and Lauren Ambrose in supporting roles. Phifer and Pullman are visible early in the trailer as, respectively, a man who survives a fatal car crash and a convict who survives execution. Those early moments establish the creepiness that underlies the premise of the season - a single day in which not a single person on earth dies - which is celebrated by the media, but which has the potential for devastating consequences. The premise is intriguingly vague, much like the premise underlying Children of Earth, and based on the trailer it appears to be well-executed. While the trailer is certainly ominous, there are moments of humor there to remind us Whovians of why we fell in love with Captain Jack and Gwen in the first place, and to entice newcomers who like a bit of fun with their sci-fi. The moment when Captain Jack, having just dived into a fountain with Havins, offers his hand and, with a rakish grin, his name to the blond American girl is a reminder of Barrowman's rougish, Nathan Fillion-esque charm, and the sight of Gwen shooting a gun with one hand while holding her baby with the other is a great juxtaposition. My favorite, however, is the trailer's final tag, where Gwen responds to a snide American's comment about being "the best England has to offer" with a resounding "I'm Welsh," followed by a punch. It's a great character moment for Gwen, while also ribbing those Americans who probably don't know anything about Wales' relationship to Great Britain. All in all, the trailer leaves me even more excited for Miracle Day's July 8th premiere. But what about you? Does the trailer get you excited for the new season? Are you as excited to see John Barrowman escape from the hell of Desperate Housewives as I am?